SpringerBriefs in Mathematical Physics 19, (2016), Springer Singapore. The goal of this workshop is to study the recent developments on one of the most long-standing and fundamental problems in Algebraic Geometry, the problem of resolution of singularities in positive characteristic, and communicate the results in its surrounding areas, with a view toward its ultimate solution. The workshop will give us a unique opportunity for the world leaders on the problem and the active experts on the subject to gather at one place and carry out intensive discussions in a seminar-style environment. We also aim at disseminating the basic techniques and methods among the younger researchers and students through the lectures given in the morning. Quantizing gravity has been one of the most difficult problems in physics. There have been many approaches to quantizing gravity, which have given us mathematically and physically interesting ideas, such as the unification of forces, the emergence of spacetime, the problem of time, information paradox, spacetime foam, non-commutativity of spacetime, extra dimensions like Calabi-Yau manifold, duality, holography, etc. Geometry, which initially found a link to gravity by Einstein has been playing a major role in the studies of quantum gravity such as matrix models, tensor models, lattice methods like causal dynamical triangulations and Regge calculus, etc. Quantum field theory (QFT), which gave us a tremendous success in describing the Standard Model including the weak, the strong and the electromagnetic forces, is also a central solid modern tool in describing physical systems with many degrees of freedom. QFT lets us explore critical phenomena and the scale dependence of the physics through the renormalization group. In this symposium, we focus on such pillars of modern physics which are tied together in the research of quantum gravity. We aim at creating an open versatile atmosphere in order to advance further in the better understanding of each approaches in order to understand the grand problems of quantum description of gravitation. Venue: The University of Tokyo (Komaba),Room 002. Brieskorn type quasi homogeneous singularities are related to the intersection theory of the moduli space of spin curves, as pointed out by Pratoussevitch and Natanzon. In this workshop, we discuss related topics of the resolution of singularity, spin structure, mirror symmetry and conformal field theory. Title: "Topology from chaos: quantum Hall physics, Haldane conjecture and beyond"
Abstract: Chaotic and topological phenomena have totally opposite characteristics: the former/latter are extremely sensitive to/robust against the change in system's details (e.g., the parameters of the Hamiltonian, the initial conditions, etc.). Thus they are commonly considered not to be compatible. In this talk, I will show how, by introducing a spin degree of freedom to the canonical model of chaotic dynamics, the so-called quantum kicked rotor (QKR), which is simply a particle moving on a ring and subjected to pulsed external force, rich dynamical behaviors of topological origin arise. These include, notably, the realization of quantum Hall physics and Haldane conjecture, which occur originally to totally different systems, namely, many-electron systems and quantum antiferromagnetic chains, respectively. I will show how a supersymmetry structure arises from the time-driving nature of QKR, and serves as a seed for a wealth of topological phenomena in this chaotic system as simple as being single-particle. Collaboration between mathematics and physics becomes more important and essential for recent development in quantum mathematical physics. We discuss new issues such as entropy of black hole, integrable system, conformal field theory and bootstrap in higher dimensions, algorithm in resolution of singularities, super moduli space, non-commutative geometry and operator algebra, and their application to quantum information and quantum computation. ​An abstract classifying invariant—a functor!—for a certain kind of given category is constructed by passing to equivalence classes of morphisms, which themselves form a category. Thus, the objects are the same, but the classifying category—so named because isomorphism of objects downstairs implies isomorphism upstairs—is typically much simpler than the given one, as many morphisms are identified by the classification functor, and many automorphisms killed. (Note that one cannot just replace objects by isomorphism classes, as one doesn’t get a category this way.) The classifying category is a priori an abstract one, but, perhaps surprisingly, in interesting cases, its Yoneda concretization becomes spectacularly simple. 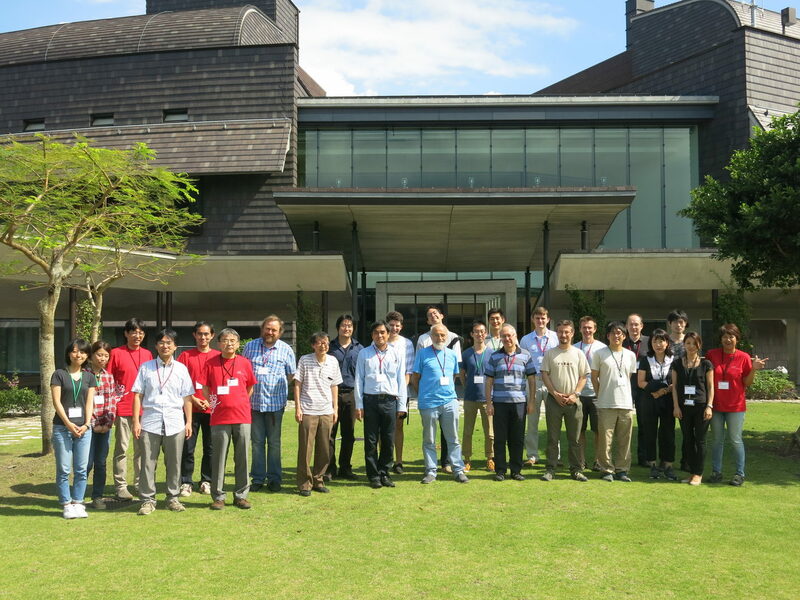 Workshop on "Hyperbolic Geomerty of the Moduli Space and Related Topics." mathematical physics and integrable systems with low-dimensional topology including hyperbolic geometry of surfaces, which induces the Weil-Petersson symplectic structure on the space. In particular, the topological recursion by Eynard and Orantin generalizing Mirzakhani's recursive formula for the Weil-Petersson volume has some strong influence in various research areas. ​In this workshop, we will intensively discuss some specific topics on the hyperbolic structure of the moduli space, and will have some talks on original researches. Title: "Elliptic solutions to BKP equation and many-body systems"
Abstract: We derive equations of motion for poles of double-periodic (elliptic) solutions to the B-version of the KP equation. The motivation is the well-known story about elliptic solutions of the usual KP equation, where the dynamics of poles is given by the Calogero-Moser many-body system with elliptic potential. The basic tool is the auxiliary linear problem for the wave function.The result is a new many-body dynamical system with three-body interaction expressed through the Weierstrass elliptic function. This system does not admit Lax representation but, instead, it is equivalent to a sort of Manakov's triple equation with a spectral parameter. We also discuss integrals of motion which follow from the equation of the spectral curve and analyze analytic properties of the wave function on the spectral curve. OIST Mini Symposium "Holographic Tensors"
Venue: Room 056, Graduate School of Mathematical Sciences Bldg., University of Tokyo (Komaba Campus). The seminar will be also aired parallel via TV conference system in Room B611 (Lab2) , OIST. Abstract: After finding superconductivity in 100 years ago, "room-temperature"superconductor has been long-fascinated target for physicists. Superconductivity above 200K was recently reported in the highly compressed hydrogen sulfide (H2S) by Drozdov et al1. The crystal structure of the superconducting sulfur hydride systems was studied by using the synchrotron x-ray diffraction at room temperature and the superconducting temperature. H2S and D2S were compressed to 150 GPa in DAC with same process with Drozdov et al1, and cooled down to 10 K in the cryostat in the x-ray diffractometer in SPring-8. The resistivity was onitored at all cooling process. The critical temperature and zero resistivity were observed around 180 K, and the collected x-ray diffraction data showed good agreement with the theoretically predicted structures of R3m and Im-3m2. No structural difference was observed between at 10 K and room temperature. The creation of the high-temperature superconductor was experimentally also confirmed by our Osaka group. H2S gas was cooled down to around 200 K and liquefied then compressed up to 150 GPa in a diamond-anvil cell (DAC). The resistance decreased with increasing pressure and showed metallic behavior in cooling process. The superconducting transition was observed at 60-70 K with zero resistance. At the second cooling after warmed up to room temperature, the resistance dropped to zero from 180 K.
This work was supported by JSPS KAKENHI Grant Number 26000006 and the European Research Council 2010-Advanced Grant 267777. A. Drozdov et al., Nature 525 73 (2015). D. Duan et al., Scientific Reports 4, 6968 (2014). Y.J. Uemura et al., Universal Correlations between Tc and ns/m∗ (Carrier Density over Effective Mass) in High-Tc Cuprate Superconductors, Phys. Rev. Lett. 62 (1989) 2317-2320. Y.J. Uemura et al., Basic Similarities among Cuprate, Bismuthate, Organic, Chevrel Phase, and Heavy-Fermion Superconductors Shown by Penetration Depth Measurements, Phys. Rev. Lett. 66 (1991) 2665-2668. Y.J. Uemura, Superconductivity: Exotic Commonalities in Phase and Mode, Nature Materials 8 (2009) 253-255. Y.J. Uemura, Energy Scales of Exotic Superconductors, an invited talk presented at the International Workshop on Polarons and Bipolarons in High-Tc Superconductors and Related Materials,Cambridge, UK, April, 1994, in Polarons and Bipolarons in High-Tc Superconductors and Related Materials, ed. by E. Salje, A.S. Alexandrov and Y. Liang, Cambridge University Press (1995), p.p.453-460. Y.J. Uemura, Energy-scale phenomenology and pairing via resonant spin-charge motion in FeAs, CuO, heavy-fermion and other exotic superconductors (Plenary Talk at SCES2008, Buzios, Brazil, Aug., 2008), Physica B404 (2009) 3195-3201. Workshop on "Moduli spaces of abelian varieties and curves, and related analysis"
Abstract: We show that a supersymmetric matrix model is a promising candidate for the first example of nonperturbative definition of superstring theory. We prove that in this model, the supersymmetry is preserved in all orders in perturbation theory in the 1/N expansion, but that it gets broken nonperturbatively and spontaneously. We observe that this breaking is triggered by an instanton in the matrix model. We also present quite recent results of correlation functions in the matrix model in all orders of the 1/N expansion by using the random matrix theory. These results convince us that the matrix model is a string theory. Venue: Komaba, University of Tokyo, Math. Dep. Room 002. Abstract: A vast variety and whole families of “synthetic conductors” have been designed by motivation and for the purpose of obtaining desired electronic and optical properties. A firework of new physical effects of electronic correlations feeds fundamental experimental and theoretical researches. Diverse phase transitions are commonly observed towards various electronic phases: superconductivity, anti-ferromagnetism, ferroelectricity, charge order, charge- and spin density waves, Mott and Peierls insulators, phases induced by high magnetic and electric fields and by optical pumping. Vulnerability of the broken symmetries gives rise to topological defects like electronic vortices, walls, stripes. The typical low-dimensional architecture of these compounds brings these objects to a microscopic scale giving rise to “solitons” which description will be the major content of this talk. The solitons are self-localized configurations which shapes explore the ground state degeneracy. The mathematics of exact solutions for many-body models relates these trajectories to profiles of waves’ arrays and of superwaves in the ocean and to pulses in optical fibers. The solitons can be the lowest energy optical excitations or the carriers of charge or/and spins, taking these functions from conventional electrons. The “instantons” appear as processes of dynamic conversion of normal electrons into solitons. In a broad class of strongly correlated systems, beyond the low-dimensionality, the solitons can persist acquiring forms of more complicated topological excitations which give incarnations to long time searched “spinons” and "holons"
Abstract: All families of carbon based materials – graphite, graphene, nanotubes, fullerenes and a vast multitude of conjugated polymers and organic crystals – are promising electronically and optically active substances. Recently a new perspective has been added to their researches: an electronic ferroelectricity. Ferroelectrics are exploited as active gate materials, in capacitors, electro-optical-acoustic modulators, in WiFi devices, in perspective RAM. Flexible lightweight carbon ferroelectrics are desired as ultrasound sensors in medical imaging. The super-polarisable state of “the ferroelectric Mott semiconductor” was discovered (Grenoble-Orsay-Moscow) in conducting organic stacks. Less conducting ferroelectrics complexes with neutral-ionic transitions (Tokyo-Tsukuba) became the objects of studies by advanced femto-second and tera-Hz optics (Tokyo). The principle novelty of organic ferroelectrics is that the polarization comes from electronic ordering rather than from ionic displacements. The microscopic design of all new materials is based on coexisting symmetry lowering effects: the dimerization of bonds and the dimerization of sites. With this forecast we could indicate the class of conducting polymers where the ferroelectricity should be present. The theory predicted an existence of solitons (which might have been already observed in Utah experiments on Kyoto materials) with non-integer variable charges, which are the walls separating domains with opposite electric polarisations. Their physics will serve to relate transient ferroelectric processes and the visible range optics. The same symmetry principle applies also to zigzag edges of graphene nano-ribbons which can be tested for the ferroelectricity. Abstract: Quantum anomalies enable us to access to some important information about quantum field theories in a robust way. Recently, the hydrodynamic limit of the systems with the anomalies has been actively investigated, together with its dual holographic description by gravitational theories with Chern-Simons terms. In this presentation, I will start with a review on the effect of the anomalies in the hydrodynamic limit of conformal field theories. Then I would like to explain how the beautiful property of Chern-Simons terms helps us to compute in detail various quantities relevant to the anomalies through the dual gravitational description. I will also discuss the implication of our analysis to microscopic counting of black hole entropy in higher dimensions.